Johann Wolfgang Muller, translator / [after Johann Wolfgang Muller and Johann Georg Klinger], JEU DE VOYAGE DES CINQ PARTIES DU MONDE [also titled:] VOYAGES aux cinq parties du monde ou JEU DE NATIONS du trois manieres. Nuremberg: George Klinger, 1805-1807. 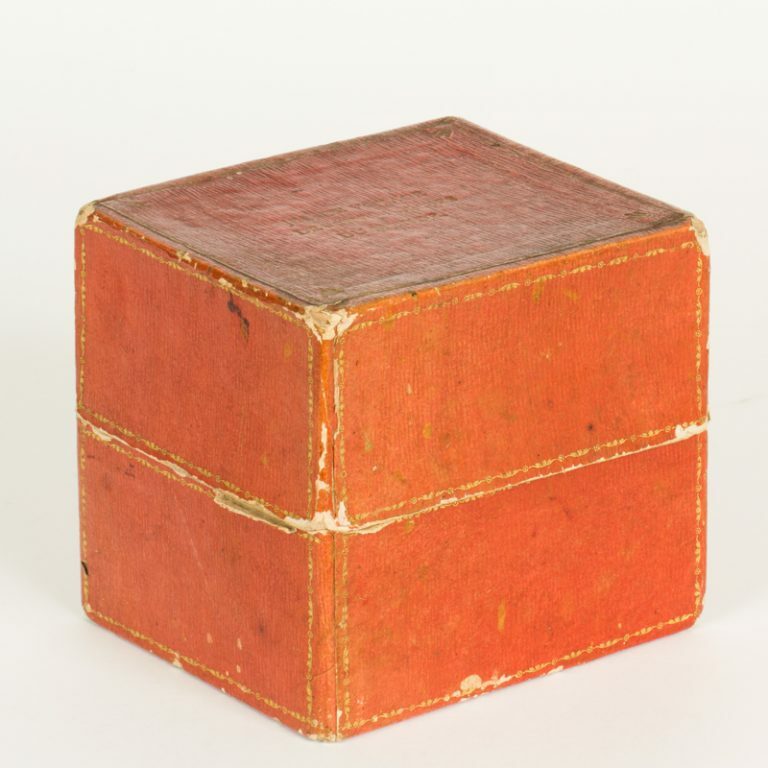 An elaborate set of materials for the playing of three geographic games, all housed in the original storage box. See below for a detailed list of the contents. Minor wear, some components in facsimile, as often the case. An elaborate, delightful and very rare boxed set containing the components for three geographic games. This clever and compact little set is the most intricate early geographical game set I have encountered. 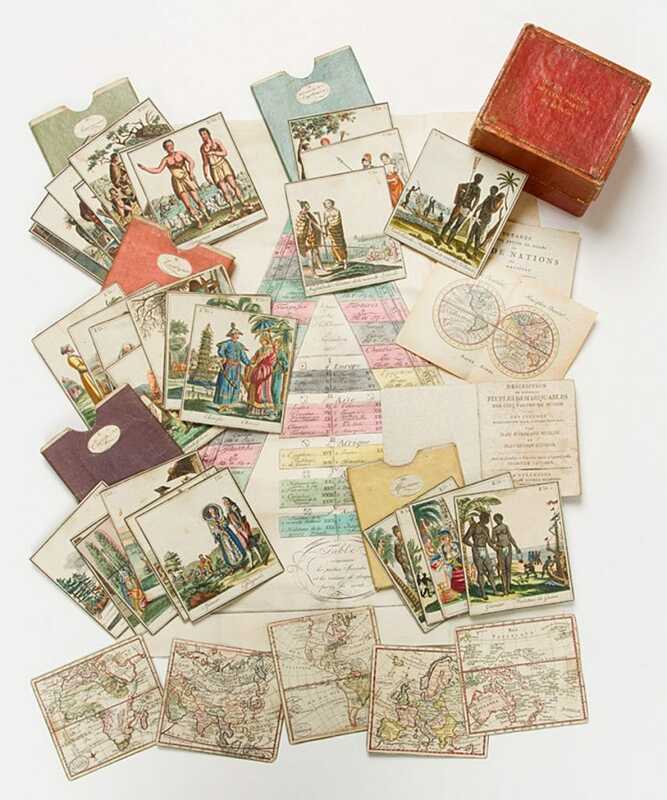 It includes dozens of playing cards, board, instructions and other materials required for no fewer than three geographic games of varying levels of complexity. All are housed in the original box of card stock covered with gilt-tooled red paper and subdivided into three internal compartments. 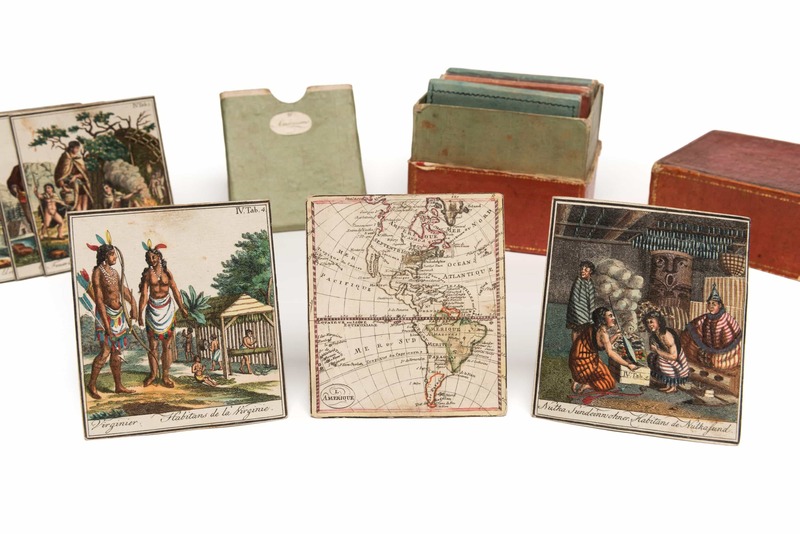 Five variously-colored slipcases, one for each inhabited continent, each with a printed title label and containing an engraved map of the continent and 4-9 engraved, hand-colored cards (4” x 3 ½”) depicting its aboriginal inhabitants, either in couples or families. Complete with five maps and 32 ethnographic cards. The American set, for example, illustrates the inhabitants of Tierra del Fuego, Patagonia, the Caribbean, Virginia, Nootka Sound, Alaska, and the Arctic. Müller and Klinger, DESCRIPTION DE DIFFERENS PEUPLES REMARQUABLES DES CINQ PARTIES DU MONDE… Nüremberg: George Klinger, 1807.xvi,127pp. 4”h x 3 ¼”w, original blue card wraps. Booklet describing the peoples depicted on each card, which, incidentally, makes it possible to verify that all cards are present. 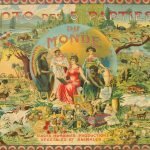 [In facsimile:] Table contenant les parties Speciales et les nations de chaque partie du monde. Nüremburg: J.G. Klinger, 1805. Hand-colored playing board in the form of an isosceles triangle, 16”h x 13 ¾”w at neat line. [In facsimile:] 4”h x 5 ½”w at sheet edge. Small double-hemisphere world map. The set comes with a small bifolium (#5, above) outlining the rules for three different educational games. Those for the first, “Jeu de Commerce,” are by far the most intricate. In short, players roll dice and draw from the geographical cards (#1) to determine movements between the 32 countries and five continents named on the triangular game board (#3). Upon landing on a space, they are expected to provide from memory a description of its inhabitants and/or geography, the quality of their response presumably to be adjudicated by reference to the booklet, DESCRIPTION DE DIFFERENS PEUPLES REMARQUABLES DES CINQ PARTIES DU MONDE(#2). Players are required to contribute coins or markers to or remove them from the pot, based partly on chance and partly on their geographic knowledge. This game is a translation of Reisen in die V Erdtheile. Beschreibung verschiedener merkwürdiger Völkerschaften in den fünf Welttheilen nebst Abbildung ihrer Nationaltrachten, first published in Nüremburg by Johann George Klinger (1764-1806) and Johann Wolfgang Müller (1765-1828). 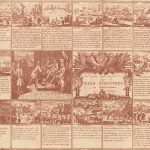 According to the preface to the rules booklet of the Milan edition, it was an improved version of a game issued in 1797 by one Georges Frederic Birckner, though a search of OCLC and Google yields no mention of either the man nor the game. Klinger is better known as a publisher of maps and globes, and the packaging of some of his pocket globes has a stylistic resemblance to the game offered here. Educator Johann Wolfgang Muller (1765-1828), who executed the translation into French, also published a number of mathematical works and in 1792 a two-volume work on the use of terrestrial and celestial globes. Given the number of components, in particular the two texts, each of which has its own title and imprint, and the variation of these titles across different editions, the game is bibliographically confusing to say the least. As best as I can tell, it was first issued in German and French in Nüremburg in 1801 or -2 (see Buijnsters, Papertoys,pp. 137-8), apparently followed closely by a Turin edition in French. Subsequent French and German editions were issued in Nüremburg at least as late as 1813 or -14, and I find reference to a Paris edition in the Gazette Nationale for October 9, 1807. Whatever the exact number and dates of the various editions, the game seems to have been a success, presumably due to the attractive engravings and clever design. Indeed I find an advert for the game on the rear wrapper of a pamphlet published by the firm of Reycend in 1833, and another ad in the December 24, 1838 edition of the Gazzetta Piemontese. Whether these are indicative of new editions or attempts to sell old inventory, I cannot say. The bibliographic complexity precludes a rigorous census of institutional holdings. 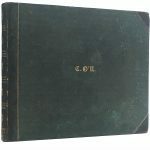 However a review of OCLC locates only an 1801-2 Turin edition at Yale and an 1813 German-language edition at the Staatsbibliothek zu Berlin. I find another example of the Turin edition at the British Library. I have also seen mention of an 1801 Nüremburg edition held by the Universiteit van Amsterdam, and two copies of the 1811 edition at Princeton, all French language. In all a remarkable and most appealing survival. OCLC 1050152476(Yale) and 930338438 (Staatsbibliothek zu Berlin), as of March 2019 The game is discussed in Thomas Stauss’ Frühe Spielwelten: Zur Belehrung und Unterhaltung. Die Spielwarenkataloge von Peter Friedrich Catel (1747-1791) und Georg Hieronimus Bestelmeier (1764-1829). Hochwald: Librum, 2014, pp. 360-65; and also in Buijnsters, P.J. & Buijnsters-Smets, Leontine, Papertoys. 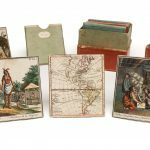 Speelprenten en papieren speelgoed in Nederland (1640-1920). Zwolle: Waanders, 2005, pp. 137-8, illus. p. 176.